Xolo A510S featuring 4 inch FWVGA Screen and 1GB of RAM has been officially launched. The smartphone is listed on company’s official website at a price of RS 7,500. It would compete with recently launched Micromax A177 Canvas Juice. The Xolo A510S has low battery capacity, which would be the main disappointment if compare ( VS ) it to the A177 Juice. The XOLO A500S IPS and A500 Club also features almost same specifications. 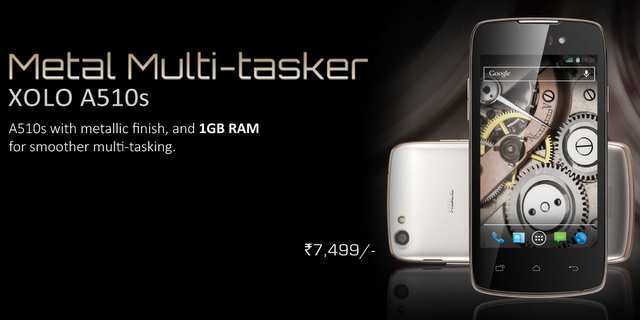 Xolo A510 draws the strength from 1.3GHz dual core MT6572 processor coupled with Mali 400MP GPU. To make the hardware run there is Android 4.2 Jelly bean OS. It packs with 5-megapixel primary camera and a secondary VGA shooter. IT houses 1400mAh battery and has 4GB of internal storage. It just 8.98 mm thick and can play plus record 720P HD videos. The Xolo A510S is available in GOLD color and is priced at INR 7,499. Sony Xperia T2 ULTRA and T2 ULTRA DUAL launched BBM for Android and iOS paused , but WHY ?